40000 hrs life long LED lamp. 120 Inch Large screen display. Multiple Interface - HDMI/VGA/USB/AV/SD Card/Audio Out. Home theater projection from settop box , DVD, Blue ray and pendrive. It is easy to install and will change the ambience of your room by a good extent. 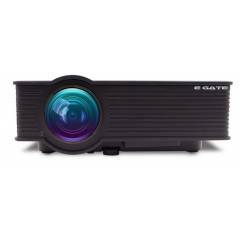 They provide the largest possible picture inside homes and can produce even smaller images to replace a normal television that takes up more room..
EGATE i9 120 Inch 1920x1080 Pixel Black LED HD Projector is a premium quality Projectors from Egate. Moglix is a well-known ecommerce platform for qualitative range of Projectors. All EGATE i9 120 Inch 1920x1080 Pixel Black LED HD Projector are manufactured by using quality assured material and advanced techniques, which make them up to the standard in this highly challenging field. The materials utilized to manufacture EGATE i9 120 Inch 1920x1080 Pixel Black LED HD Projector, are sourced from the most reliable and official Projectors vendors, chosen after performing detailed market surveys. Thus, Egate products are widely acknowledged in the market for their high quality. We are dedicatedly involved in providing an excellent quality array of Egate Projectors.